Get instant access to a free live streaming chart of the RTS Standard. 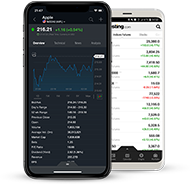 The chart is intuitive yet powerful, offering users multiple chart types including candlesticks, area, lines, bars and Heikin Ashi. There are flexible customization options and dozens of tools to help you understand where prices are headed. Draw freehand or apply a variety of technical indicators. Compare different instruments on the same chart as well. This advanced chart is powered by TradingView and is considered to be one of the best HTML5 charts within the industry.